In Spain, depending on your taste and budget, there is the possibility of religious and civil marriages. Whether you choose to hire a planner or take the occasion into your own hands, an outstanding site for the wedding can make it epic. The following cities give us the best venues to get married in Spain which offer wedding planning services and a full guarantee of a successful wedding ceremony. The beautiful city of Madrid has revamped itself over the past few years. With its perfect structure for culture-rich weekends, finger-licking good food, and beautiful atmosphere, it most definitely is the ideal site for your wedding ceremony. Surrounded by exceptionally perfect wedding ceremony planners, the city of Madrid stands out as one of the most luxurious and sophisticated cities for the perfect Spanish wedding, as it harbors El Castillo de Batres, El Cortijo de Monico, Finca Felingre, and Natalia Ortiz Events to make your wedding ceremony the best. With its broad coastline with seven beaches, Barcelona being a patchwork of architectural stylishness, Gothic façades close to the harlequin buildings of the Modernistas, the sky-high buildings of Jean Nouvel or Herzog and the Meuron. Wedding planners like Spain for Weddings in addition to hotels such as the Cortal Gran and the H10 Metropolitan Hotel make this city the ideal venue for your special day. With months of endless sunshine, a relaxed pace, and unbeatable food, Barcelona will most definitely give you the best wedding experience. Gothic and Renaisssance Monuments, lively nightlife, dynamic museums, and miles of beach! A decade of extensive development has made Valencia – the third largest city in Spain – to have some of the most eye-catching architecture in the entire country. The presence of the Casa Benigalip and wedding planners like El Laboratorio Imaginario make Valencia a perfect venue for the perfect wedding. This is one of the most romantic, gorgeous, and unspoiled stretches of coastline in Europe. This area has some of the best Blue Flag beaches in Europe, wide and sandy, stretching to the aesthetic horseshoe bays and distinctive smuggler’s coves. Its exceptional food and independent hotels make good accommodation facilities for guests. With its many accessible venues like La Costa Golf & Beach Resort, Hotel Vistabella, Hotel Peralada Wine Spa & Golf, and Casa Anamaria, hotel & villas, Costa Brava stands as one of the most luxurious places to get married in Spain. Found in Sevilla is the beautiful Giralda Cathedral with is eye-catching top views of the city. Sevilla harbors the biggest old quarter in Europe where Romans, Arabs, Jews, and Phoenicians have left a lasting mark which is still appreciable till date. The majestic Plaza de España, is found in this city which is home of the Iberio-American Exposition of 1929 and an inspiration for many Hollywood movies. Hotel NH Collection Sevilla and NH Sevilla Viapol provide you with one of the most luxurious wedding settings and planning in the whole of Spain. A wedding in Spain in the city of Sevilla will most definitely be perfect. 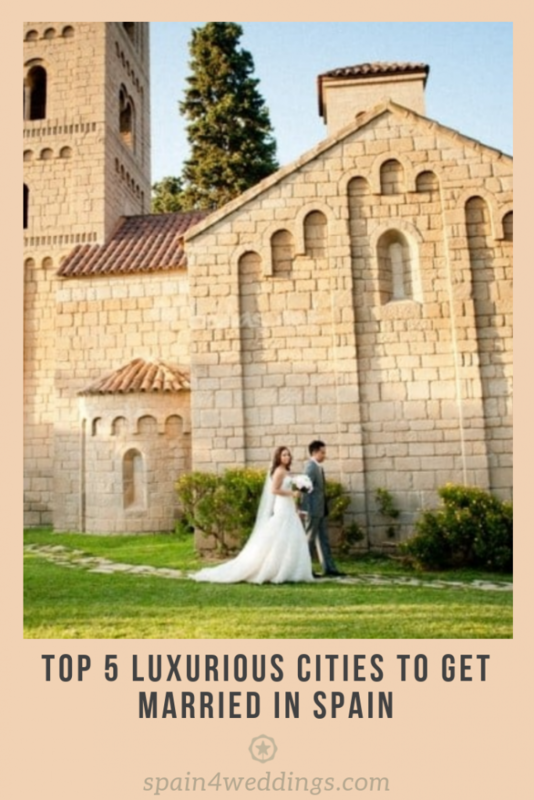 Outlined above are the top five cities we recommend you use as venue for a wedding in Spain. Getting married in any of these places will definitely be worth it for both you and your spouse. This is an experience you wouldn’t like to miss out on.